Is Sportsman’s Warehouse Holdings Inc (SPWH) Going to Burn These Hedge Funds? Sportsman’s Warehouse Holdings Inc (NASDAQ:SPWH) investors should pay attention to an increase in activity from the world’s largest hedge funds in recent months. SPWH was in 15 hedge funds’ portfolios at the end of September. 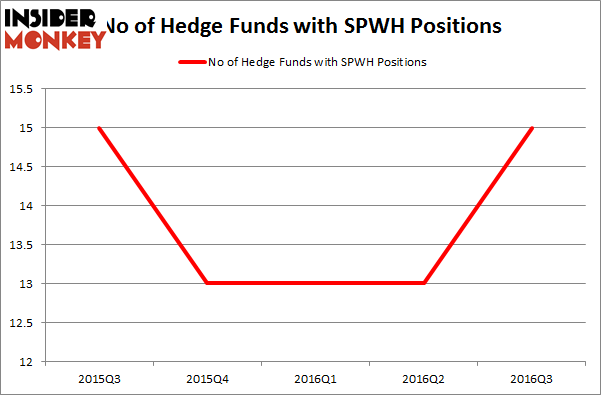 There were 13 hedge funds in our database with SPWH positions at the end of the previous quarter. At the end of this article we will also compare SPWH to other stocks including Heritage Commerce Corp. (NASDAQ:HTBK), San Juan Basin Royalty Trust (NYSE:SJT), and Boingo Wireless Inc (NASDAQ:WIFI) to get a better sense of its popularity. What does the smart money think about Sportsman’s Warehouse Holdings Inc (NASDAQ:SPWH)? At Q3’s end, a total of 15 of the hedge funds tracked by Insider Monkey held long positions in this stock, a rise of 15% from one quarter earlier. By comparison, 13 hedge funds held shares or bullish call options in SPWH heading into this year. With hedge funds’ capital changing hands, there exists an “upper tier” of notable hedge fund managers who were upping their holdings meaningfully (or already accumulated large positions). Of the funds tracked by Insider Monkey, Jamie Mendola’s Pacific Grove Capital has the biggest position in Sportsman’s Warehouse Holdings Inc (NASDAQ:SPWH), worth close to $8.2 million, amounting to 3.1% of its total 13F portfolio. The second most bullish fund manager is Steve Cohen of Point72 Asset Management, with a $7.9 million position. Some other members of the smart money with similar optimism contain Israel Englander’s Millennium Management, and Anand Parekh’s Alyeska Investment Group. We should note that none of these hedge funds are among our list of the 100 best performing hedge funds which is based on the performance of their 13F long positions in non-microcap stocks.